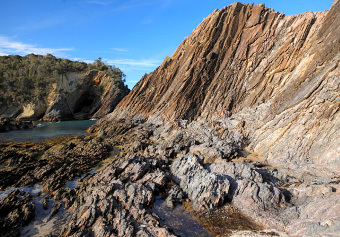 Guerilla Bay rocks are some of the oldest rock formations on the east coast of Australia - dating as far back as the Ordovician period some 450 million years ago. 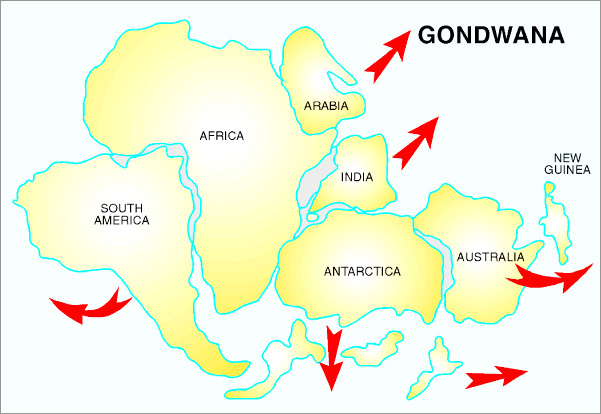 These rock structures were laid down possibly during an interval of subduction in what was the ancient Pacific Ocean, before becoming part of the Gondwanaland continent incorporating Australia, Antarctica, India, South America and Africa. A subduction zone is an area where tectonic plates collide together, with one plate overlapping and overriding the other; the subducted plate - the plate underneath - can sink to great depths in the Earth's mantle. 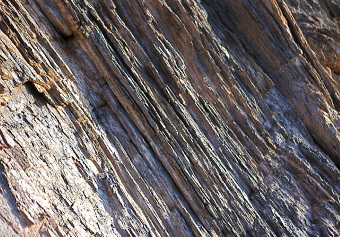 Through the high temperatures and pressures associated with this process, seabed sediment is converted to rock. Although plate movement only occurs at a rate of centimetres per year (comparable to fingernail growth rates), an active zone such as in Japan or New Zealand, can cause massive tsunamis and earthquakes. 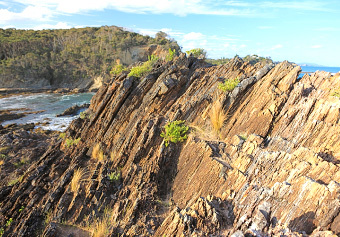 The rocks at Guerilla Bay consist mainly of feldspathic greywacke, chert and shale of the Wagonga Group that has been squeezed, bent and broken after formation, possibly as a result of compressive movement within the ancient subduction zone. The Guerilla Bay rocks now contain of a mix of fragments called tectonic melange. Also evident in the chert rocks are tooth-like microfossils (less than 1mm) from the gut of extinct eel-like animals: however a microscope is needed to see these minute fossils. 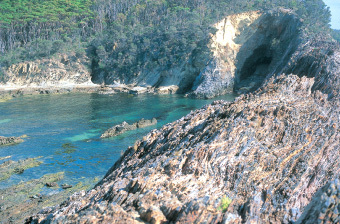 Guerilla Bay is 13km south of Batemans Bay and accessible from George Bass Drive. Drive south along the Princes Highway to Mogo, turn left into Tomakin Road, and left into George Bass Drive. Alternatively, take the scenic coast route from Batemans Bay along Beach Road to George Bass Drive via Batehaven, Lilli Pilli, Malua Bay and Rosedale. From George Bass Drive, turn east into Burri Point Rd which takes you to Guerilla Bay. There is a small car park, a few picnic tables but no other amenities. There is plenty of accommodation available in the local area including caravan parks and motels.